That's a Whole Lot of Bananas! 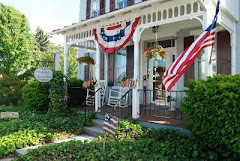 Just three miles from the inn lies a food lover’s dream. It’s the largest smorgasbord in Lancaster County. In a county that has quite a few PA Dutch restaurants, that’s saying something! Here are the numbers: 40 items on the salad bar, 7 meats, 14 vegetables and over 25 desserts. Each day of the week features a different highlight. Tuesday is seafood night – a favorite of our guests. Our advice is to go hungry and get the roast beef, broasted chicken and dried corn. We can’t get enough of these! A smorgasbord is also an opportunity to try some Pennsylvania Dutch foods that you might be curious about – like chow-chow, chicken-corn chowder, pepper cabbage, and shoofly pie. Though it’s big – I recently learned that it’s the largest one on the east coast, (last year they fed 1,345,000 people), they do a great job of keeping it very clean. And you’ll never feel rushed. Shady recently earned a plaque from Sight and Sound Theaters announcing that they are the dining choice of their customers. Speaking of numbers, that’s a lot of folks as well! 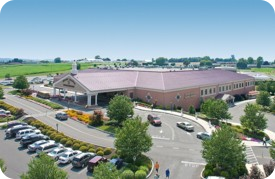 Our guests not only enjoy the enormous buffet, but the gift shop and farm market too. And what a farm market it is. Shady makes its own sausages - we serve the sundried tomato and basil chicken sausage at breakfast. 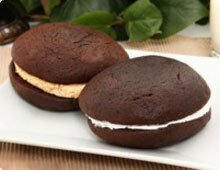 It has a large bakery section (try the gourmet peach bread) and even carry gluten-free whoopie pies. Shady buys fresh local produce from our local farmers auction (just outside of Terre Hill). And, best of all, Shady Maple is very good to the community, supporting a lot of local charities. So the money stays locally rather than benefiting some huge company out in Arkansas. I was at a luncheon recently and learned that Shady’s two biggest sellers are donuts (they sold one million last year) and bananas - over 600,000 lbs. - that’s more than the 30,000 in Harry Chapin’s song! So the next time you find yourself in Lancaster County and craving either a banana or donut, you now know where to go!